There are many variations of acupuncture. Some techniques attach electrodes to the needles to deliver a small current to the acupuncture point. Other techniques focus solely on the points in your ears, hands or scalp. There are even therapies that use sound to stimulate the needles. TCM has a sophisticated pharmacy of herbal medicines. Most of the medicinal formulas are herbal but some formulas include animal or mineral ingredients as well. Unlike Western herbology, Traditional Chinese Medicine does not use single herb remedies; its formulas can have as many as 18 ingredients. There are many ways to take the herbs. Traditionally people boiled the herbs to make a decoction. This method is time consuming and, depending on the herbs, can taste terrible. To make the herbs easier to take, more and more TCM formulas are available as liquid extracts, tablets, capsules or granules. When a formula is used topically, it is available as a lotion, cream, salve or poultice. Moxibustion uses heat to warm acupuncture points. There are 2 ways to heat the points—direct and indirect. The direct method uses tiny cones of moxa (dried mugwort) placed on the herbal cream on the skin. The moxa is lit and the combination of the heat and the medicinal qualities of the moxa stimulates circulation and balances the flow of Qi. The indirect method is more popular because the practitioner can control the heat. The practitioner lights a cigar-like stick of moxa and holds it near the skin until the skin is warm. Alternately, acupuncture needles are inserted into the skin and warmed with moxa burned on top of the needles. 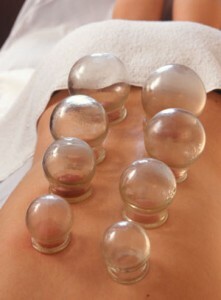 In a cupping treatment, the practitioner uses suction to pull on skin and soft tissue. This pulling stimulates circulation and promotes healing. There are two ways to create suction—with heat or a pump. In the first technique, the practitioner takes a glass cup the size of a baby food jar and ignites a flame inside of it. The flame causes a vacuum inside the cup and it is immediately placed on the skin. The second technique uses a pump to create a vacuum inside a plastic or rubber cup. Newer silicone cups are pressed against the skin to create the suction. In all cases the vacuum inside the cup pulls on the skin to create the therapeutic effects. Gua Sha is an ancient therapy typically used to treat pain, remove toxins, improve circulation and move stuck Qi. In this treatment the skin is coated with oil and rubbed or scraped with a rounded instrument like a coin, spoon or piece of buffalo horn. Typically the back, neck or shoulders are scraped, but occasionally the chest or abdomen as well. The strokes follow the direction of the ribs and spine and leave distinctive long, red patches on the skin. Tuina is medicinal massage. This TCM therapy uses massage techniques to balance the flow of Qi through the meridians. You wear loose, comfortable clothing and may be seated or lying down. During the treatment the practitioner may use a wide range of techniques, from massaging the soft tissue, acupressure or manipulations to herbal compresses, liniments, ointments or heat. Tuina is different than “spa massage” because its intent in medicinal. While it may result in stress reduction, pain relief or increased range of motion, the treatment itself may be uncomfortable because many of the massage techniques can be quite vigorous and deep. The purpose of the massage is to balance the Qi and the result is that you leave feeling lighter, freer and more energized. All of these TCM therapies require a practitioner to give you the treatment. If you are curious about any of them, give me a call and I’ll be happy to tell you more about them. And if you are a Do-It-Yourselfer, you are not forgotten. In the next part of this series, you will learn TCM therapies that you can do at home. This article was posted in Acupuncture, Wellness and tagged acupuncture, acupuncturist, chinese medicine, cupping, gua sha, herbs, moxibustion, Oregon, salem, tuina. Bookmark the permalink. Follow comments with the RSS feed for this post. Both comments and trackbacks are closed.